The beginning of the week was sunny, but cool. 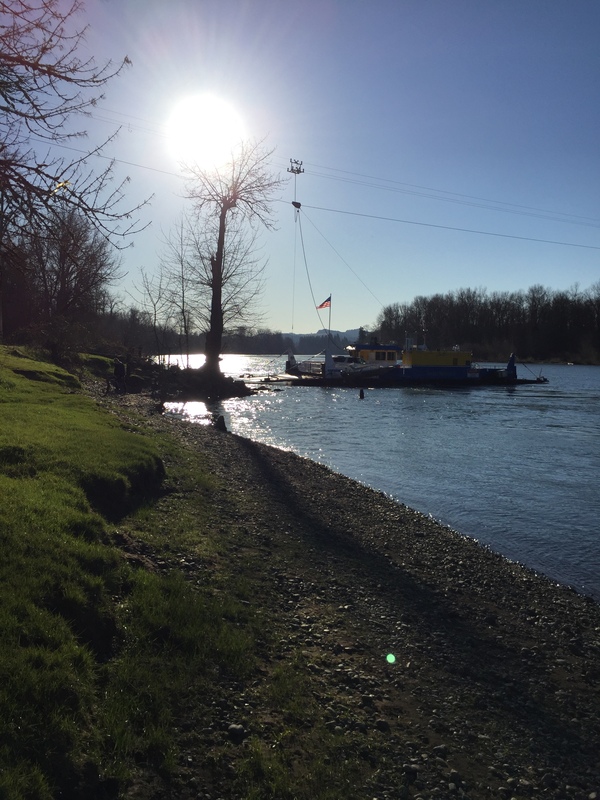 One afternoon, when she got home from school, Michaela and I went down to the river to watch the Wheatland Ferry. She needed to buy some Valentines, so we did her errands first, then decided to take a little ride, since it was so sunny. So, with French fries in hand, we drove down to the sparkling river, and spent some time throwing rocks into the river, counting the cars that crossed on the ferry, and just enjoying the afternoon. It really perked up her afternoon, and I enjoyed myself very much, as well. I’m always delighted to find a low-cost outing to do with her. It does her good to get out into the fresh air. In fact, she had so much fun, that she came up with a plan for Tuesday afternoon. 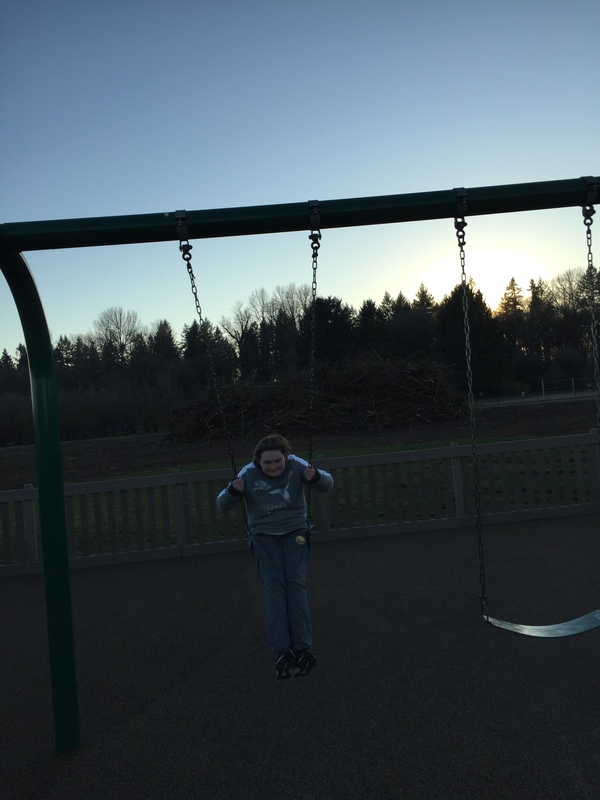 On Tuesdays, Jake stays after school for choir, so we decided to take him to a near-by park to swing, even though evening was approaching. Unfortunately, we were only able to stay for a short time, when he began to feel poorly. We went right home. He stayed with me Wednesday morning and all day Thursday. He laid down or sat down all day, both days, at my house. My mom took him to his house Wednesday afternoon, where he proceeded to sleep for 2 hours. I’m sure he is fine now, but his daddy was able to care for him after that, if he needed it. In the midst of it all, life went on, as it does. 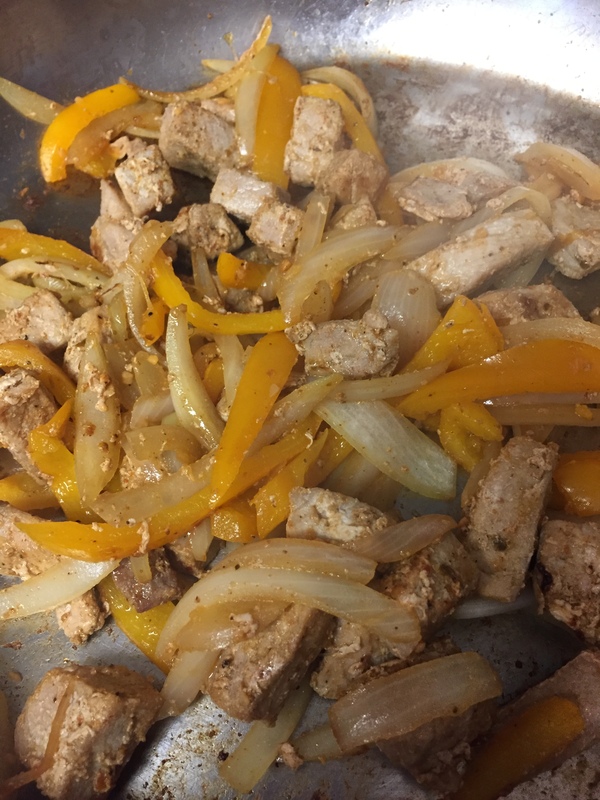 I made fajitas with some pork chops that were getting old in the freezer, an old pepper I found in the fridge, and an onion. Rob ate that for a couple of day for dinner and in his lunch. 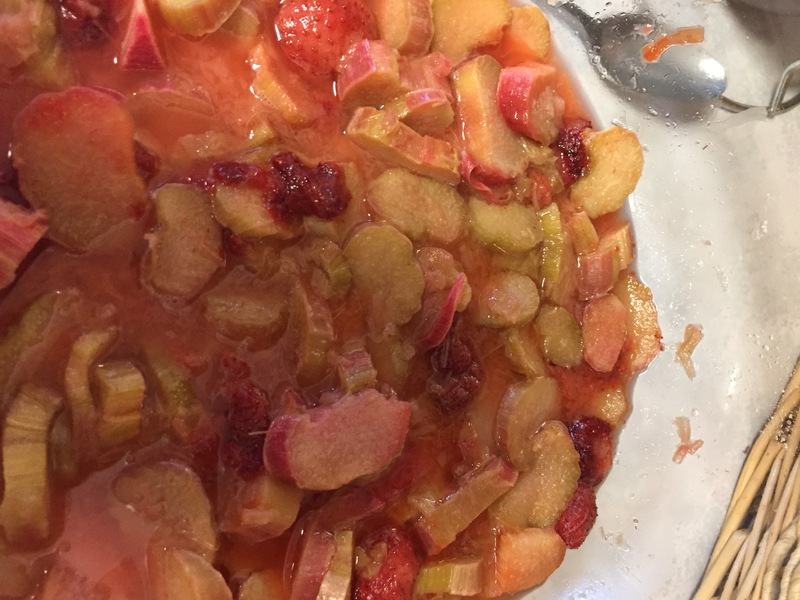 I made rhubarb/strawberry crisp with some frozen fruit that had been there for quite a while. I made some ground pork-vegetable soup with frozen veggies, pork, potatoes, etc. Alissa made biscuits. We snacked on popcorn. I made pizza from pre-made crusts I had on hand. At the end of the week, my schedule got crazy, and so we had food from Wendy’s, and then Rob got me a real treat, Chinese food, on Saturday, because I was correcting and grading school work. He was treating me because he knows how much I love teaching and don’t love correcting. I corrected home-school work for about 7 hours on Friday night and Saturday, most of that being on Saturday since I was gone all day Friday. We have a meeting coming up where I need to turn in grades, etc., for the diploma program the girls are enrolled in. It’s still significantly less money than a private school, so it’s worth it to me to do all the correcting, etc. The price wars continue in the grocery stores near where my aunt and sister live. It’s only about 20-25 minutes away, and we go there frequently, so I’m not complaining. (It’s not far in miles, it’s traffic that takes the time). I got potatoes for 10 lbs/99c (2 bags), Ritz for 99c/box (1), apple juice for 99c (I ended up with 7 because 2 stores were doing this one), pork loin for 99c/lb (2-4 lb chunks), 25c cans of tomatoes (2), Honey Nut Cheerios (99c/box), and chili-48c/can (2). At the Fred Meyers near me, I got the other apple juices and peanut butter for 99c (5), tuna for 50c/can(5), pasta for 50c/lb(5), and my free candy bar. Going to multiple stores, shopping the sales, downloading and clipping coupons, and keeping track of prices takes a lot of work, but since it turns my modest grocery budget into a nicely stocked pantry, I don’t mind. I was able to go to JoAnn’s and use the last gift card I had in my stash. Patterns were 99c, so I got a handful. 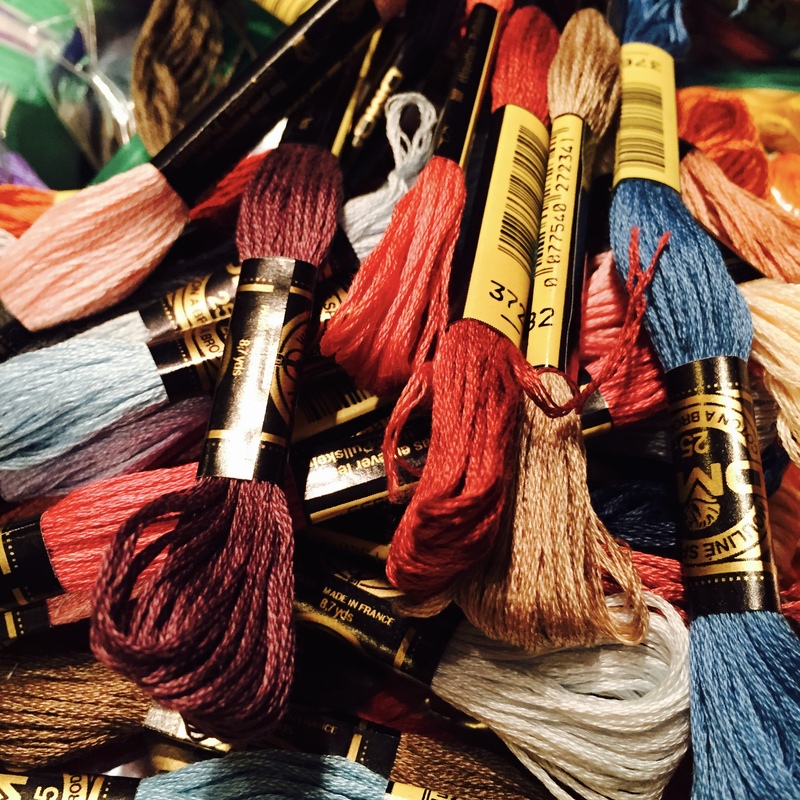 I got some floss, as I have been embroidering towels, and can’t find my extra floss stash. Thankfully, it’s not expensive and I only needed a very few colors for what I’m working on. I will continue to look through the bins in the shop for my floss! So frustrating when I had my hands on it so recently, but……it happens. A couple of years ago, I was given a huge ziplock full of floss. I recently put that floss in a very safe place. In a bin. In the shop. It’s still there. Very safe. Very, very safe. Sounds like a great week, Becky! I have never used that app. I’ll have to check it out. Sounds like a great week. I can’t wait to see how your towels turn out. I love embroidering towels because they are fun to do, and very useful gifts. I’m eager to get another batch done as well. Today, though, I’m trying to make some pj pants for one girl and a nightie for another. They are cut out! It’s a good start. Oh yes. Many of my craft supplies are in similar size/shape plastic boxes. I have them triple stacked in my closet so I always think this will be easy to find but I end up taking down nearly a dozen before I find what I want. I won’t complain too much. It’s rather like Christmas opening each box. The picture of the river is beautiful! I had to laugh at about your floss story. I tend to store things and cannot find them, and I have a small house ! This house is so tiny! It amazes me that I can lose so many things. My problem is that I store things in bins, and then can’t remember which bin they are in! Your story of having things ‘safely stored away’ really made me chuckle. I’m the same way. In fact, I was just organizing/cleaning under my bathroom sink and ‘found’ something. REally….under the sink,, that was a good place for storage i thought. I have lots of bins as well. I’ve started using painter’s tape (long story, it was leftover) on the bin as a label. One of the benefits over any other type tape is the painter’s tape peels off with no residue left behind. Yes. Labeling the bins would be the smartest idea. I am always in a hurry and think I can remember. Hmmmmm. We did lose something lately that we had put in a safe place but now I can’t remember what it was and we never found it so it is really, really lost now! The river looks so nice and we would love an outing like that too. We just came back from 15 days at the lake house so we have to get back in the saddle here. Those grocery prices are great! I think those stops for the loss leaders are well worth it too and that keeps our pantry stocked as well. I’m glad you got 15 days at the lake house. You enjoy it so much when you go there, you’ve shared. And, if you are going to have a lake house, it makes sense to go there as much as you can! I am forever putting things away in a “safe” place – often so safe that they remain hidden, for years! Or, I file things away for safekeeping and then, can never find them afterwards! I am sure you’ll find your floss when you are looking for something else – that’s usually what happens with me! Does losing yourself in a new town count? Ha, ha:). Of course it does!